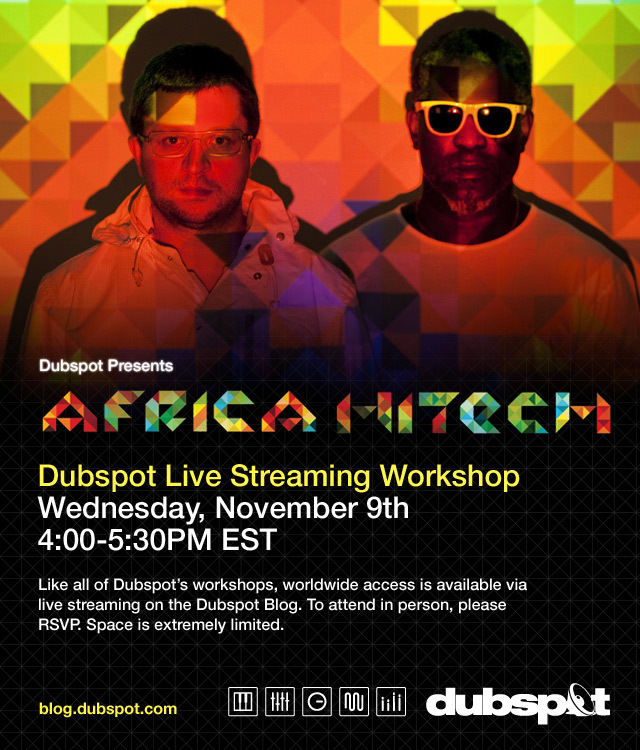 Warp Records duo Africa Hitech (Mark Pritchard and Steve Spacek) descended upon Dubspot NYC to present a workshop on the inner workings of their “Congo Natty” sound. It all traces back to Africa. Whether it be the swing, the syncopation, or the offbeats that bless various club musics with a soul, they all owe gratitude to the continent. It’s a part of reggae, hip hop, and soul as much as it is jungle, Detroit techno, and footwork. Yet that’s only where’s it’s been, so what’s over the next horizon? This is the underlying curiosity that brought Mark Pritchard and Steve Spacek together as Africa Hitech. Together they’ve developed a brash, complex dynamic that has given them a new level of recognition, but both have storied solo careers. Pritchard has wide interests and appeal as evidenced by his 26 alias, such as Troubleman and Harmonic 313. 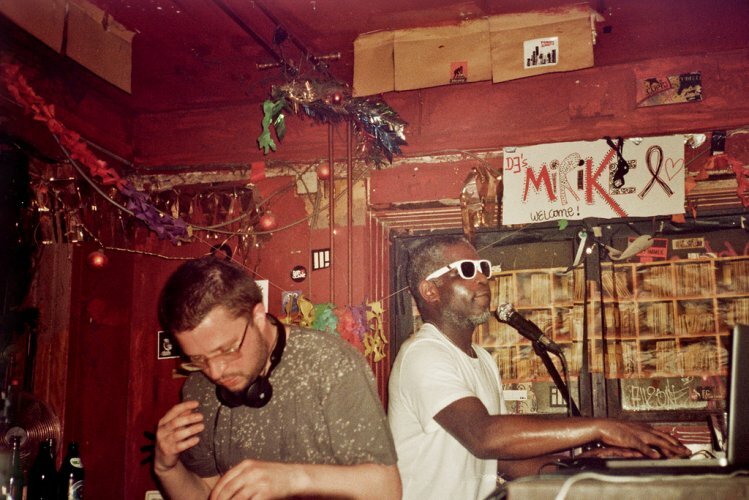 And Spacek has been skipping chapters into the future as a beat maker and singer through collaborations with the likes of J Dilla on “Dollar” and with Morgan Zarate as part of a trio called Morgan Spacek. The two began planting strong roots in their quest to cultivate the future while surrounded by the nascent dubstep scene in 2004. Their first collaborations were “Without You” and the later-released “Turn It On“. Both were weighty and foggy, reserved in a certain sense. But when Africa Hitech grafted together officially in 2010 – marked by the release of the Blen EP – their wilder, weirder side became more evident. The drums were frequently sped up and off kilter, synths were smeared with grime sensibilities, and bleeps would bubble frantically in the roiling pot. When the Hitecherous double EP dropped only months later, it was clear they wouldn’t stand still. They didn’t work within genres, but rather the commonalities between them linked by a past and present. Africa Hitech’s debut album 93 Million Miles only furthered this approach, which they call “the Congo Natty sound”. And now you can see how they realize these ideas at their Dubspot workshop. 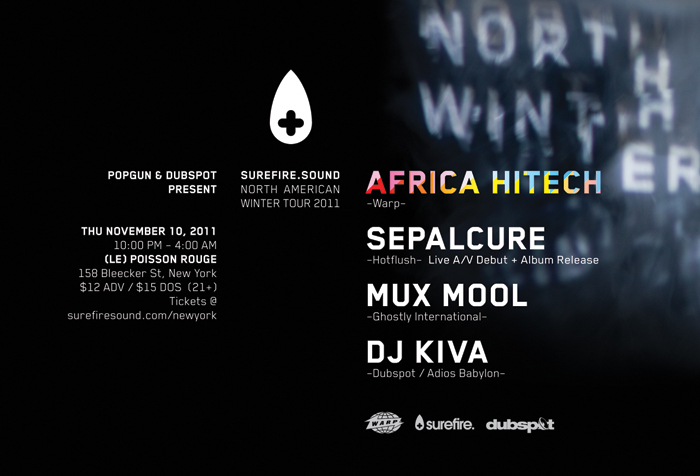 Hitech will also be performing in New York on Thursday, November 10th, at Sepalcure’s album launch at LPR NYC. Where can these workshop posts be found?